The Address Verification System (AVS) is a system used to verify the identity of the person claiming to own the credit card. The system will check the billing address of the credit card provided by the user with the address on file at the credit card company. The other security features for the credit card include the CVV2 number. AVS verifies the numeric portions of a cardholder's billing address. For example, if your address is 101 Main Street, Highland, CA 92346, AVS will check 101 and 92346. Sometimes AVS checks additional digits such as an apartment number, other times it does not. If the address does not match then the transaction is declined and sent back to the merchant. This is another way to ensure that the owner of the card is, in fact, the one using it. You can configure your AVS settings directly on your payment gateway. 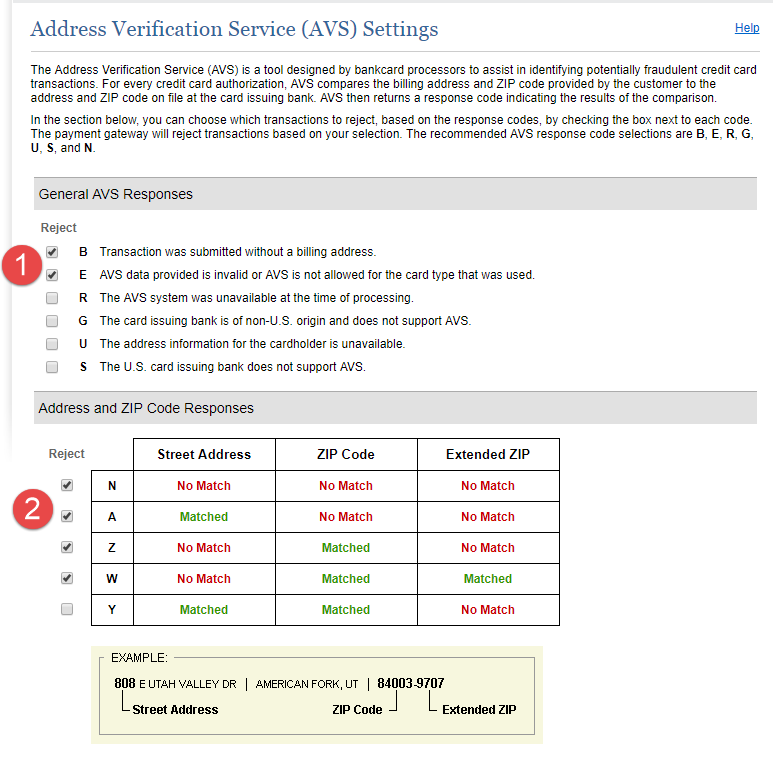 Here we see that Auth.net is set to reject any transaction that comes through with no billing address, or if the AVS data was not allowed based on the card type (#1). W. Reject even if the extended ZIP code is correct but the street address is not. Y. Since this is not checked, transactions with a correct address and a ZIP code but without an extended ZIP code will not be rejected. The card security code (CSC), sometimes called Card Verification Data (CVD), Card Verification Value (CVV or CVV2), Card Verification Value Code (CVVC), Card Verification Code (CVC or CVC2), Verification Code (V-Code or V Code), or Card Code Verification (CCV) is a security feature for credit or debit card transactions, providing increased protection against credit card fraud. Click the Pay Methods link. Click the Edit link beside the active pay method for which you want to enable AVS. 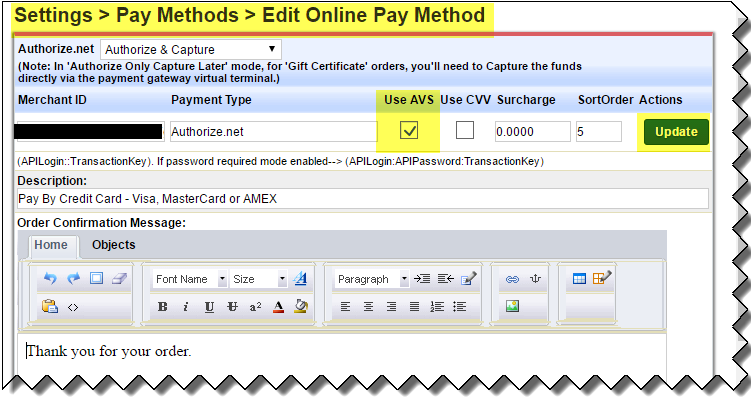 In the editor for your pay method, select the Use AVS checkbox. Note: If you wish you can also enable CVV code. Please note that if CVV is checked, then the checkout will validate the CVV code. If AVS is checked, the credit card address will be validated. Once AVS is enabled, we recommend that you post an order with a valid credit card to check the integration. Note 2: AVS and/or CVV code validation must also be enabled at the payment gateway. To ensure this is enabled and working correctly, please contact the support department for your payment gateway.